Chances are you're well acquainted with Diptyque and their cult-favorite fragrances, candles, and body-care products. Well, hold onto your repurposed brush cups, ladies: The brand has just launched, for the first time ever, a full range of facial skin-care products. Besides being drop-dead lookers in their absurdly chic packaging (of course), the formulas themselves are just as fancy. The brand was inspired by "slow infusion," which is a traditional method of cosmetic making where flowers, leaves, or seeds are gently distilled to extract the plants' nutrients. The star of the line is the Damask rose — doesn't that scent just sound gorgeous?! It's paired with jasmine, white lily, clay, rice powder, and even something called essential floral wax, which sounds intriguing and fabulous. We're swooning already. Oh, and did we mention that the products are unisex? Hold on for a minute while we go toss every skin-care product belonging to either us or our respective S.O. 's — our bathrooms will become shrines to Diptyque L'Art du Soin henceforth. 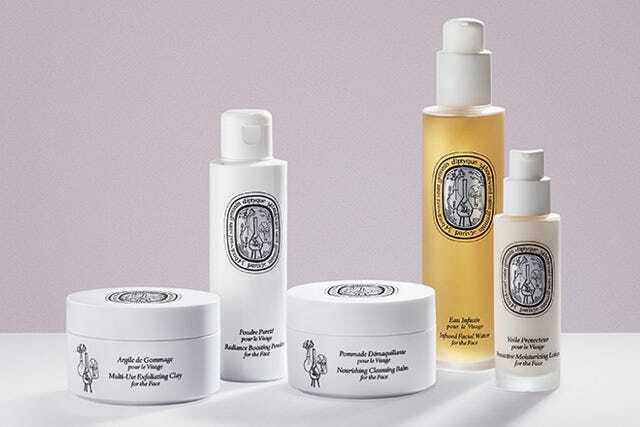 Diptyque L'Art du Soin Facial Skin Care Collection, $55-72, available in March at Diptyque.